TV show dates: March 29, 2018 — present. Performers include: Alex Roe, Eline Powell, Fola Evans-Akingbola, Ian Verdun, Rena Owen, Sibongile Mlambo, Chad Rook, Aylya Marzoff, Ron Yuan, Tammy Gillis, Curtis Lum, Anthony Harrison, Hannah Levien, Andrew Jenkins, David Kaye, and Sedale Threatt, Jr.
Based on a story by Eric Wald and Dean White, who executive producew with showrunner Emily Whitesell, the Siren TV show is a fantasy mystery thriller. The drama unfolds in Bristol Cove. Legend has it, this small fishing village was once home to mermaids. One day, Ryn (Powell) arrives in town. She is nothing if not an enigma, with a dark secret. 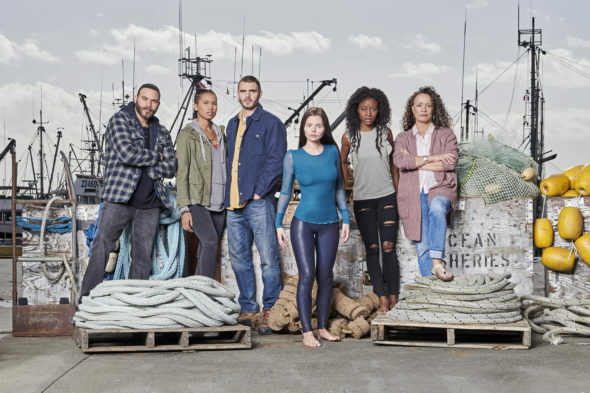 While Ben (Roe), a marine biologist, finds himself drawn to her, his co-worker, Maddie (Evans-Akingbola), is deeply suspicious of the newcomer. A deep sea fisherman, Xander (Verdun), sets out to discover what’s really going on. Meanwhile, either despite or because of her eccentricities, shopkeeper Helen (Owen) seems to have a deeper understanding of the mystery. Together, Ben and Maddie begin to research how and why this once beloved (and up until now, supposedly mythical) creature is a ruthless hunter. Are there more like her out there, ready to stake claim to the sea, itself? Stay tuned. What do you think? Do you like the Siren TV series? Should this Freeform TV show be cancelled or renewed for another season? RENEW IT! DVD BOXED SETS OF PAST SEASONS TOO! Love this show so much and my whole family love it , we’ve watched both seasons over and over we also record it. I’m in Australia n first show in ages I’ve watched been memorized by , laughed and cried , all my friends love it too . Please don’t cancel this TV show my granddaughter and I can’t wait to see the next episode love the show. FREEFORM already took away my Shadowhunters please don’t cancel Siren also. We all need some alternate lifeforms to love. Please do not cancel. It is a very interesting show! renew! I like the show! This show is amazing! Please keep it on.